Las Vegas Ballpark 2019 Home Schedule! Las Vegas Announces 2019 Home Schedule in the new Las Vegas Ballpark; "Home Opener" on Tuesday, April 9 vs. Sacramento! LAS VEGAS: The Las Vegas PROFESSIONAL baseball team of the Pacific Coast League (PCL), Triple-A affiliate of the New York Mets, announced today the HOME schedule for the 2019 season in the new Las Vegas Ballpark. The "home" opener will be on Tuesday, April 9 vs. Sacramento River Cats, Triple-A affiliate of the San Francisco Giants. 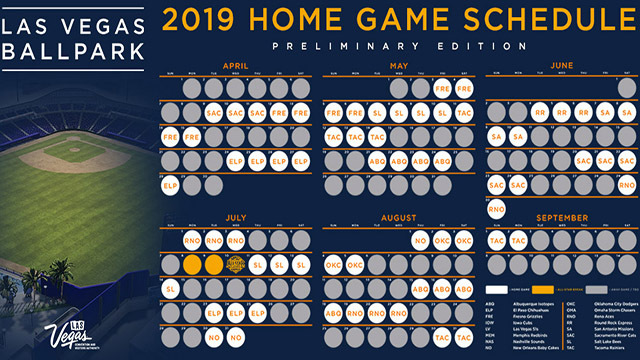 The initial homestand will consist of seven games against Sacramento from Tuesday-Thursday, April 9-11 and a four-game series against Fresno Grizzlies, Triple-A affiliate of the Houston Astros, from Friday-Monday, April 12-15.